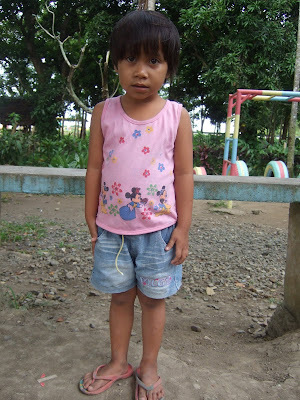 The Tapulanga Foundation is looking for donors to sponsor these children. Get to know each one and you can choose your scholar! These children would like to start Kindergarten in SFAS in June 2010. I am Jayzel Negrito. I was born in October 10, 2005. I live in Hacienda Lonoy, Silay City. My father is Marcial and he works as a laborer in a sugarcane farm earning Php3000 or $90 a month. My mother is Josephine and she works as janitress (earning Php5000 or $110 a month) in St. Francis of Assisi School where I want to go to school. I have 2 brothers and 2 sisters: Jaybie graduated in SFAS and is now in college; Mark (3rd year) and Mary Jo (Kinder) are now studying and scholars in SFAS; and Jessa May is my baby sister. I want to be a teacher or a stewardess when I grow up. My favorite food are hotdog and fried chicken. I like to dance. I sweep the floor at home. I am Arvin Convicto. I was born in May 7, 2004. I live in Sitio Dungcaan, Brgy. Latasan, Silay City. My father is Alvin and he works as a casual laborer in a sugarcane farm. My mother is Rosalinda and she stays home. I am an only child. I want to be a doctor when I grow up. My favorite food is vegetables. I like to play. I sweep the floor at home. I am Reigniel Torreno. You can call me Tor. I was born in October 12, 2005. I live in Bag-ong Dalan, Bgry. Tabigue, E. B. Magalona. My father is Erniel and he works as a contractual welder earning Php4500 or $100 a month. 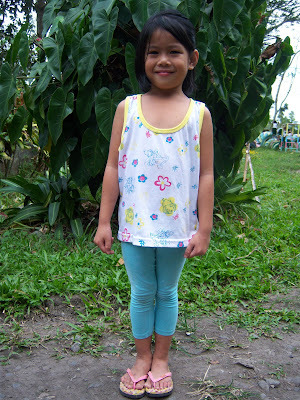 My mother is Reah and she works as an office secretary earning Php5,800 or $130 a month. I am an only child. I want to be a teacher or a seaman when I grow up. My favorite food are Valenciana and spaghetti. My favorite cartoon characters are Power Rangers and Ben 10. I like to color. I sometimes sweep the floor at home. I am Kimberly Capablanca. You can call me Kim. I was born in August 20, 2004. I live in Sitio Cayum-it, E. B. Magalona. 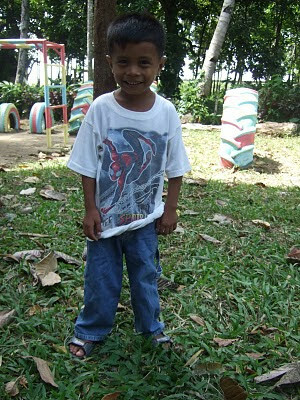 My father is Cesar and he is a tractor driver earning Php4000 or $90 a month. My mother is Berly and she stays home. I have 1 sister who is 1 1/2 years old and her name is Cherrybell. I want to work in a hotel or restaurant when I grow up. My favorite food are hotdog and spaghetti. I like to sing and dance. I help my mother in cleaning the house. I am Christine Joy Navigar. You can call me Inday. I was born in February 7, 2005. I live in Hacienda Lonoy, Silay City. My father is Regnor and he works as a laborer in a sugarcane farm earning Php6,500 or $145 a month. My mother is Mary Jean and she is a teacher (earning the same amount like my father) in St. Francis of Assisi School where I want to go to school. I have 2 brothers: Michael (3rd year) and Ronnie Jude (1st year) are now studying and scholars in SFAS. I want to be a nurse when I grow up. My favorite food is fried chicken. My favorite cartoon character is Winnie the Pooh. I like to to draw and dance. I help my mother wash dishes. 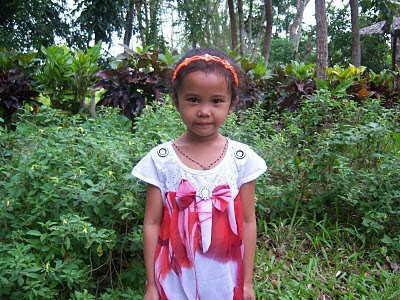 It costs Php7000 or $160 a year to send each child to school. IF YOU ARE INTERESTED TO HELP! 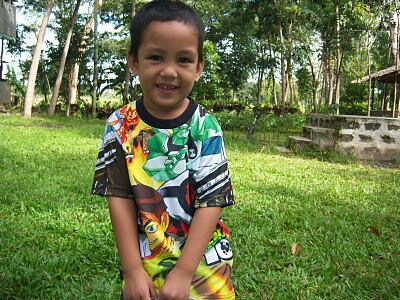 From a generous friend: Yes, I would love to sponsor Arvin Convicto. The kid with a great smile who loves vegetables and wants to be a doctor. What drew me to him the most was the fact that I don't eat vegetables and my ambition at one point was to be a doctor. I hope I'll be able to help him achieve that dream.